In August, I quit my job at Autodesk Pier 9 as a Shop Staff member in their unique fabrication facility. I had started there as an artist-in-residence in 2014 and continued on as a part-time employee to help other artists realize amazing projects, specifically teaching them electronics, coding and virtual reality techniques. Everything changes. The company that I worked for is no longer supporting artists as they once did. I’ve spent the summer doing some soul-searching. I reflected on what was special about the Pier 9 Artist-in-Residency program. I moved on. What I have for you is Xenoform Labs — a new experiment that I launched just this October. Xenoform Labs is located in the Mission District in San Francisco and is my studio, a workshop space and an art residency program. That’s right, an artist-in-residency program. The Xenoform Labs Residency is an invitation-only art residency program for new media artists from outside of the Bay Area. I provide free housing and studio space for 1 month for one selected artist/couple. The studio includes digital media, virtual reality hardware, media production and light fabrication. During the residency period, I will host events for the artists to connect with local thinkers, artists and curators in the Bay Area. I hope to support 2-3 artists per year with flexible timing. The studio supports digital media, virtual reality hardware, media production and light fabrication. Xenoform Labs will host events for the artists to connect with local thinkers, artists and curators in the Bay Area. We plan to support 4-5 artists per year with flexible timing. The idea for the residency is to provide a space for experimentation and the development of new works and ideas. I hope to support open-ended inquiry and possible collaborations instead of production work for a final exhibition. My first guests were Ruth Gibson and Bruno Martelli, who are friends and colleagues that I met at the Banff New Media Institute in 2009. British electronic arts duo Gibson / Martelli make live simulations using performance capture, computer generated models and an array of technologies including Virtual Reality. Artworks of infinite duration are built within game engines where surround sound heightens the sense of immersion. Playfully addressing the position of the self, the artists examine ideas of player, performer and visitor – intertwining familiar tropes of videogames and art traditions of figure & landscape. Extending the physical into the virtual, we will work to develop novel body-based interfaces for virtual reality. One of the drivers for our research has been thinking about how we can interface performance with virtual reality. In earlier works, performers were motion-captured and avatars visualized in a kind of ‘inside-out’ performance-in-the-round. Taking this a step further we see live performance being ‘beamed’ into a virtual space using electronics hardware. The idea for this residency is about extending Ruth’s somatic practice into virtual space – so that the user experiences it more as a visceral sensation, rather that as a primarily visual experience. This will be enabled perhaps, by creating physical interfaces that subtly encourage this. One month wasn’t long enough! I miss them already. There is nothing quite like setting up an art residency while it is happening. The studio space is in an apartment. One kitchen. Two studio rooms. A small balcony in the backyard. Ruth and Bruno stayed downstairs a separate bedroom. 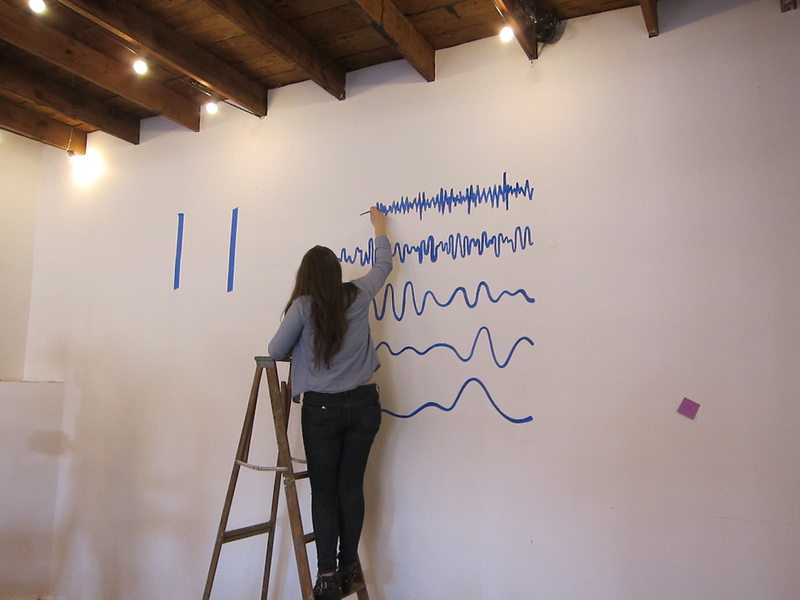 Located in the center of the Mission, the Xenoform Labs Residency was a vortex of activity. We set up a common workspace in the front room. Since it is also my studio, I am essentially co-working with the artists. I stocked the kitchen with dishes on loan, put vinyl for Xenoform Labs on the front door, added my own artwork to the center room, bought some camping chairs so we could lounge on the back deck and did loads of other small things to make it feel homey. In the evenings, we would all work or go out to an art event. Ruth and Bruno met colleagues: curators, artists, thinkers, technologist and many more. At times it was overwhelming…I hope in a good way. I discovered that the Xenoform Labs Residency could be a site for conversations around leveraging technology as a critical art practice. With this residency, I plan to slowly build networks of cross-geographical understanding and experimentation around new media art. First of all, breath sensors are a remarkable way to navigate in VR. Ruth and Bruno assembled a sensor that monitors the rhythm of your lungs as you inhale and exhale. Upon the inhale, you ascend in VR space and as you the exhale, you descend. It was magical, like scuba diving. Also, I love hosting and giving a reason for people to come over to the studio — engaging their curiosity with the work and experiments of Ruth & Bruno. We hosted three separate events: a meet n’ greet, VR Salon and closing event. The format was casual for all of these, where invited guests could drop in and see what the residents were doing. This event structure worked well. And, there is a lot of mundane things to do: cleaning, grocery-shopping, finding tools, directing the residents to the best coffee joint in town and so on. I embraced being a tour guide and was also grateful that they pitched in on dishes and were lovely housemates. Finally, the visitors were super-enthusiastic. The concept of doing a small-scale residency in San Francisco generated so much interest and support amongst friends and colleagues. As often is the case, you go through a moment of imposter syndrome. Is this really happening? Yes, it is, because the residents arrived, made art and people came over to talk with them. It’s the real deal. In the short-term, I’m setting up a private workshop + talk series starting in early December with programing in January and February. You can find all the workshops here. Of course, I’m working on the next round of residents for 2019. It’s an invite-only program for artists who live outside of San Francisco. I am open to nominations, just contact me here. This turns out to be more work than I thought! I’m trying to find the right fit: not just any qualified artist, but one who is angling to be on the more social side and yearns for conversation and connection to the unique cultural scene in the Bay Area. Plus, there is a lot of maneuvering around complex schedules. In the last few weeks, I’ve developed a deep empathy for arts administrators. What Happened to the Readymake: Duchamp Chess Pieces? Over the last several months, we (Scott Kildall and Bryan Cera) have been contacted by many people asking the same question: What happened to the Readymake: Duchamp Chess Pieces? The answer is that we ran into an unexpected copyright concern. The Marcel Duchamp Estate objected to the posting of our reconstructed 3D files on Thingiverse, claiming that our project was an infringement of French intellectual property law. Although the copyright claim never went to legal adjudication, we decided that it was in our best interests to remove the 3D-printable files from Thingiverse – both to avoid a legal conflict, and to respect the position of the estate. Readymake: Duchamp Chess Set is a 3D-printed chess set generated from an archival photograph of Marcel Duchamp’s own custom and hand-carved game. His original physical set no longer exists. We have resurrected the lost artifact by digitally recreating it, and then making the 3D files available for anyone to print. We were inspired by Marcel Duchamp’s readymade — an ordinary manufactured object that the artist selected and modified for exhibition — the readymake brings the concept of the appropriated object to the realm of the internet, exploring the web’s potential to re-frame information and data, and their reciprocal relationships to matter and ideas. Readymakes transform photographs of objects lost in time into shared 3D digital spaces to provide new forms and meanings. Just for the sake of clarity, what we call a “readymake” is a play on the phrase “readymade”. It is ready-to-make, since it can be physically generated by a 3D printer. Our Readymake project was not to exist solely as the physical 3D prints that we made, but rather as the gesture of posting the 3D-printable files for anyone to download, as well as the initiation of a broader conversation around digital recreation in the context of artwork. We chose to reconstruct Duchamp’s chess set, specifically, for several reasons. The chess set, originally created by Duchamp in 1917-18, was a material representation of his passion for the game. Our intention was not to create a derivative art work, but instead to re-contextualize an existing non-art object through a process of digital reconstruction as a separate art project. What better subject matter to speak to this idea than a personal possession of the father of the Readymade, himself? Given the artifact’s creation date, we believed it would be covered under U.S. Copyright Law. We’ll get back to that in a bit. On April 21st, 2014, we published this project on our website and also uploaded the 3D (STL) files onto Thingiverse, a public online repository of free 3D-printable models. We saw our gesture of posting the files not only as an extension of our art project, but also as an opportunity to introduce the conceptual works of Duchamp, specifically his Readymades, to a wider audience. The project generated a lot of press. By encouraging discussion between art-oriented and technology-oriented audiences, it tapped into a vein of critical creative possibilities with 3D printing. And perhaps, with one of Marcel Duchamp’s personal belongings as the context, the very notions of object, ownership and authenticity were brought into question among these communities. Unfortunately, the project also struck a nerve with the Duchamp Estate. On September 17th, 2014, we received a cease and desist letter from a lawyer representing the heirs of Marcel Duchamp. They were alleging intellectual property infringement on grounds that they held a copyright to the chess pieces under French law. We assessed our options and talked to several lawyers. Yes, we talked to the Electronic Frontier Foundation…and others. We were publicly quiet about our options, as one needs to with legal matters such as this. The case was complex since jurisdiction was uncertain. Does French copyright law apply? Does that of the United States? We didn’t know, but had a number of conversations with legal experts. 1) Duchamp’s chess pieces were created in 1917-1918. According to US copyright law, works published before 1923 are in the realm of “expired copyright”. 2) The chess pieces themselves were created in 1917-1918 while Duchamp was in Argentina. He then brought the pieces back to France where he worked to market them. 3) According to French copyright law, copyrighted works are protected for 70 years after the author’s death. 4) Under French copyright law, you can be sued for damages and even serve jail time for copyright infringement. 5) The only known copy of the chess set is in a private collection. We were originally led to believe the set was ‘lost’ – as it hasn’t been seen, publicly, for decades. 6) For the Estate to pursue us legally, the most common method would be to get a judgment in French court, then get a judgment in a United States court to enforce the judgement. 7) Legal jurisdiction is uncertain. As United States citizens, we are protected by U.S. copyright law. But, since websites like Thingiverse are global, French copyright could apply. Many people have told us to fight the Estate on this one. This, of course, is an obvious response. But our research indicated this would be a costly battle. We pursued pro-bono representation from a variety of sources, and while those we reached out to agreed it was an interesting case, each declined. We even considered starting a legal defense fund or crowdsourcing legal costs through an organization such as Kickstarter. However, deeper research showed us that people were far more interested in funding in technology gadgets than legal battles. Finally we ascertained, through various channels, that the Estate was quite serious. We wanted to avoid a serious legal conflict. And so, without proper financial backing or pro-bono legal representation, we backed off — we pulled the files from Thingiverse. This was painful – it was incredible to see how excited people were to take part in our project, and when we deleted the Thingiverse entry and with it the comments and photo documentation shared by users, we did so with much regret. But we didn’t see any other option. Initially, we really struggled to understand where the estate was coming from. As part of the estate’s task is to preserve Duchamp’s legacy, we were surprised that our project was seen by them as anything other than a celebration, and in some ways a revitalization, of his ideas and artworks. Despite the strongly-worded legal letter, we heard that the heirs were quite reasonable. The resolution was this: we contacted the estate directly. We explained our intention for the project: to honor the legacy of Duchamp, and notified them that we had pulled the STL files from online sources. We were surprised by the amicable email response — written sans lawyers — directly from one of the heirs. Their reply highlighted an appreciation for our project, and an understanding of our artistic intent. It turns out that their concern was not that we were using the chess set design, but rather that the files – then publicly available — could be taken by others and exploited. We understand the Estate’s point-of-view – their duty, after all, is to preserve Duchamp’s legacy. Outside of an art context, a manufacturer could easily take the files and mass produce the set. Despite the fact we did put this under a Creative Commons license that stipulated that the chess set couldn’t be used for commercial purposes, we understand the concern. If we had chosen to stand our ground, we would have had various defenses at our disposal. One of them is that French law wouldn’t have applied since we are doing this from a U.S. server. But, the rules around this are uncertain. If we had been sued, we would have defended on two propositions: (1) our project would be protected under U.S. law; (2) not withstanding this, under U.S. law, we have a robust and widely-recognized defense under the nature of Fair Use. We would make the argument that our original Duchamp Chess Pieces would have have added value to these objects. We would consider invoking Fair Use in this case. But, the failure of a legal system is that it is difficult to employ these defenses unless you have the teeth to fight. And teeth cost a lot of money. We thought about how to recoup the intent of this project without what we think will be a copyright infringement claim from the Duchamp Estate and realized one important aspect of the project, which would likely guarantee it as commentary is one of parody. Accordingly, we have created Chess with Mustaches, which is based on our original design, however, adds mustaches to each piece. The pieces no longer looks like Duchamp’s originals, but instead improves upon the original set with each piece adorned with mustaches. The decorative mustache references vandalized work, including Duchamp’s own adornment of the Mona Lisa. Coming out with this new piece is risky. We realize the Duchamp Estate could try to come back at us with a new cease-and-desist. However, we believe that this parody response and retitled artwork will be protected under U.S. Copyright Law (and perhaps under French law as well). We are willing to stand up for ourselves with the Chess with Mustaches. Also for this reason, we decided not to upload the mustachioed-pieces to Thingiverse or any other downloadable websites. They were created as physical objects solely in the United States. 3D printing opens up entire new possibilities of material production. With the availability of cheap production, the very issue of who owns intellectual property comes into play. We’ve seen this already with the endless reproductions on sites such as Thingiverse. Recently, Katy Perry’s lawyers demanded that a 3D Print of the Left Shark should be removed from Shapeways. And in 2012, Golan Levin and Shawn Sims provided the Free Universal Construction Kit, a set of 3D-printable files for anyone to print connectors between Legos, Tinker Toys and many other construction kits for kids. Although he seems to have dodged legal battles, this was perhaps a narrow victory. Our belief is that this our project of reviving Duchamp’s chess set is a strong as both a conceptual and artistic gesture. It is unfortunate that we had to essentially delete this project from the Internet. What copyright law has done in this case is to squelch an otherwise compelling conversation about the original, Duchamp’s notion of the readymade in the context of 3D printing. Will our original Duchamp Chess pieces, the cease-and-desist letter from the Duchamp Estate and our response of the Chess with Mustaches be another waypoint in this conversation? And what would Marcel Duchamp have thought of our project? We can only guess. https://kildall.com/wp/wp-content/uploads/2019/02/logo-1.png 0 0 Scott Kildall https://kildall.com/wp/wp-content/uploads/2019/02/logo-1.png Scott Kildall2015-09-02 15:33:232015-09-04 03:46:33What Happened to the Readymake: Duchamp Chess Pieces? I’m experimenting with a new model for sustainable art practice: leveraging the intellectual property from my technology-infused artworks into lucrative contracts. And why not? Artists are creative engines and deserve to be compensated. Teaching is how many of my ilk get their income and every professor I’ve talked to about the university-academia track constantly moans about the silo-like environment, the petty politics, the drudgery of the adjunct lifestyle and the low pay. They are overworked and burdened by administration. No thanks. The other option is full-time work. Recently (2012-13), I was on full-time staff at the Exploratorium as a New Media Exhibit Developer. I love the people, the DIY shop environment and the mission of the organization. It was here that I fully re-engaged with my software coding practice and learned some of the basics about data-visualization. But, ultimately a full-time job meant that I wasn’t making my own artwork. My creative spirit was dying. I couldn’t let this happen, so when my fixed-term job came up, I decided not to try to pursue full-time employment. I now work with the Explo on selected part-time projects. This year, I started an LLC and in January, I had landed my first contract job, which was to do the software coding, technical design and visitor interaction for a project called “EEG Dinner Party”, which was part of a larger installation for General Electric, which they called the “GE BBQ Research Center” to be presented at SXSW in Austin. The folks I directly worked with were Sheet Metal Alchemist (Lara and Sean who run the company, below) — they are fantastic company who build custom-fabrication solutions. 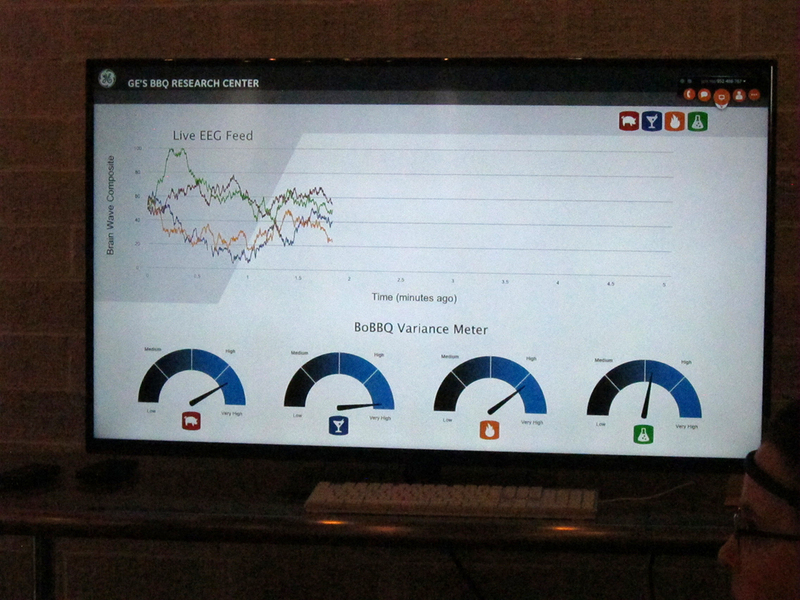 They helped General Electric produce this interactive experience for SXSW, which featured a giant BBQ smoker with sensors and the EEG Dinner Party, which was the portion I was working on. My “intellectual property” was my artwork, After Thought (2009), which I made while an artist-in-residence at Eyebeam Art + Technology Center in New York. This is a portable personality testing kit using EEG brainwaves and flashcards, where I generate a personal video that expresses your “true” personality. 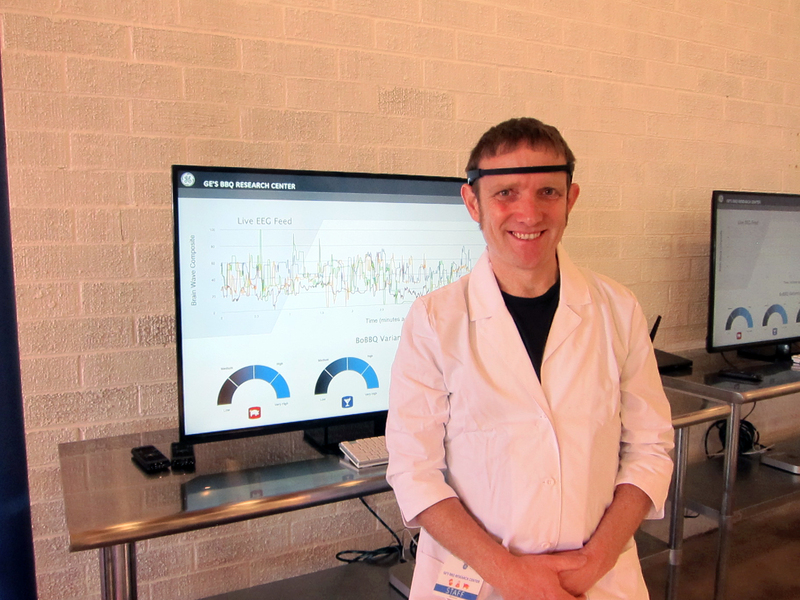 I dressed in a lab coat and directed viewers in a short, 5-10 minute experiment with technology and EEG testing. When the folks at Sheet Metal Alchemist (SMA) contacted me about doing the EEG work, I was confident that I could transform the ideas behind this project — an interactive experience into one that would work for SXSW and General Electric. From the get-go, I knew this wasn’t my art project and I didn’t have my usual the creative control. For one, General Electric that had a very specific message: “Your Brain on BBQ” and the entire SXSW site was designed as a research lab, of sorts. It was a promotional and branding engine for GE, who provided free meat and beer for the event. The work that SMA did was just a portion, albeit the attractor (the smoker) and the high-tech demo (EEG) of what was going on, but GE also had videos, displays in vitrines, speakers, DJs and a mix-your-own-BBQ sauce stations. New Creatures were the ones that put the entire event together (check out the video at the end of this post). The irony: I don’t even eat meat. I treaded the delicate balance doing of doing client work combined with my own artistic/tech designs. While I don’t work for GE, nor is their message mine, we’re all in it for a temporary goal: to produce a successful event. The end-result was an odd compromise of social-messaging, technology and visitor experience, which ended up being a very successful installation at the event. The concept was the we conduct a series of “dinner parties” (it was actually during the day) where two tables of four people each would sit down and eat a 5-minute “meal”. We would track their brainwaves in real-time and generate a graph showing a composite index of what they were experiencing. All of the event staff costumed ourselves in lab coats. Here I am with the two monitor display, wearing the EEG headset, which we chose: the Muse Headset, which after doing a lot of research, beat the pants off the competitors, Neurosky and Emotiv for its comfort and developer’s API. The technical setup took awhile to figure out, but I finally settled upon this system, which was very stable. Each of the eight headsets was paired to a cheap Android tablet. The tablet then streamed the EEG data to two separate Processing applications, one for each table via Open Sound Control (OSC). The tablet software that I wrote was based on some of the Android sample code from Muse and would show useful bits of information like the battery life and connection status for the 4 headset sensors. Also check out the “Touching Forehead” value. This simple on/off was invaluable and would let us know if the headset was actually on someone’s head. This way, I could run tables of just 1 person or all 4 people at a time. Each headset was assigned to a separate graph color and icon. My software then graphed the real-time composite brainwave index over the course of 5 minutes. The EEG signals are alpha, beta, delta, gamma and theta waves. But, showing all of these would be way too much information, so I produced a composite value of all 5 of these, weighting certain waves such as beta and theta waves (stress and meditation) more than others such as alpha (sleep). We ran the installation for 3 days. We soon has an efficient setup for registration and social media. You would make a reservation ahead of time and a greeter would fill in the spots on for empty tables. The next lab technician would have everyone digitally sign consent forms and ask for their personal information such as your name and Twitter handle. We soon had a reasonably-sized line. My job was to make sure the technology worked flawlessly. I would clean headsets, check the tablets, do any troubleshooting, as necessary. Fortunately, the installation went off very smoothly. We had just one headset stop working one the 2nd day and on the 3rd day, a drunk guest knocked one of the tablets off the table, shattering it. Of course, we had backups. After fit all the guests with the headsets and make sure the connections worked, I’d pass the them off to Sean, who talked about EEG signals and answered questions about what the installation was all about. After about 5 minutes, we had people sitting at tables. Then, they got served. Food, that is. Here is a piece of sausage from the smoker, some coleslaw and a bit of banana cream pudding. 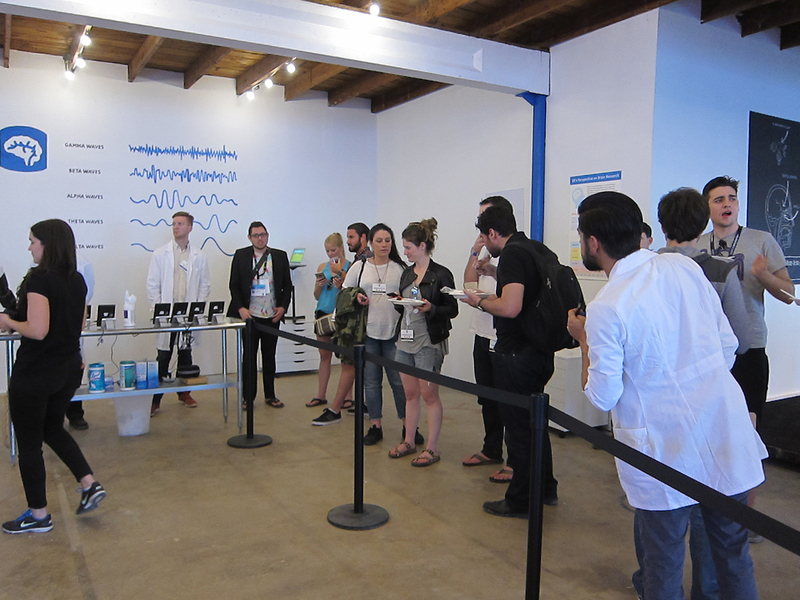 As folks ate, they watched their brainwaves graph in real-time. Each headset was marked with the corresponding color on the graph. One dot was for Table A and two for Table B. The guests got a kick out of it, that’s for sure. And while they consumed food, the photographer shot closeups of people eating. If you chose to be at the EEG Dinner Party, you certainly had to have no fear of the media. Then, the social media team would do a hand-tracing of the graph and send out an animated image via Twitter, like these. Of course, they ended up getting retweeted. And we had some celebrities! Here is Questlove. My concluding thoughts on artwork-as-IP: it’s solid paid work. My billable rate is at least 3 times higher than any non-profit work that I do, which translates to a more sustainable art practice. My coding skills got sharper — this was my first Android application. I didn’t feel like I had to dial in the fine creativity and was more of a tech lead on the project. So, overall a success and I’m hoping I can do some future paid gigs with my technology-based artwork. *As promised, here is the Hot Wheels Double Dare project, produced by New Creatures.